Visiting the Ellwanger Estate is like looking through a kaleidoscope at the 19th and 20th centuries. It is serene and pastoral. The Ellwanger Estate is nestled in its own country-like setting and is surrounded by graceful copper beeches, a majestic fern leaf beech tree. The stately Blue Spruce is one of the first brought to Rochester, New York from the state of Colorado. The historical rehabilitation and restoration efforts reflect the love and care for fine craftsmanship and architectural skills. Five fireplaces exemplify the Ellwanger’s Estate grandness, along with rich oak paneling, carved pillars in the Great Room and Grand Hall, and a glass enclosed conservatory. 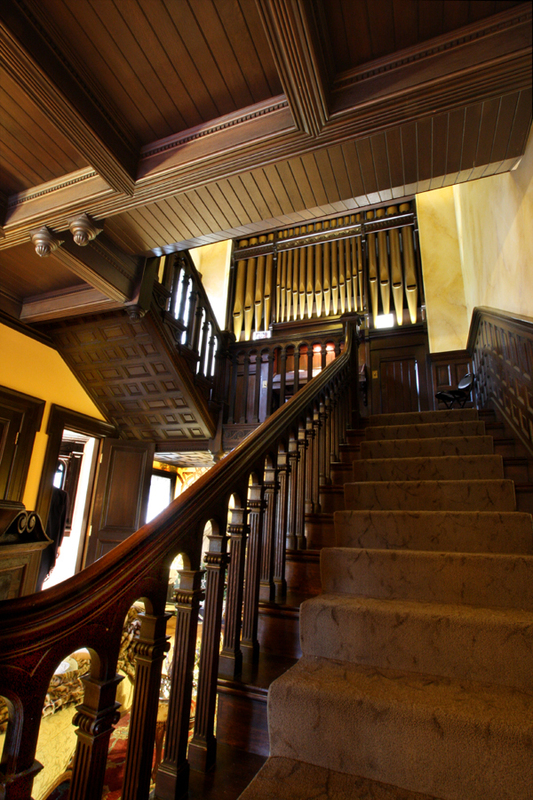 The Grand Hall is dominated by a beautifully carved oak staircase that reaches upward to a landing where an 1878 Hooks and Hastings pipe organ commands an imposing image. The fireplaces, antique furniture, collection of books, and piano are meant for use not ornament. 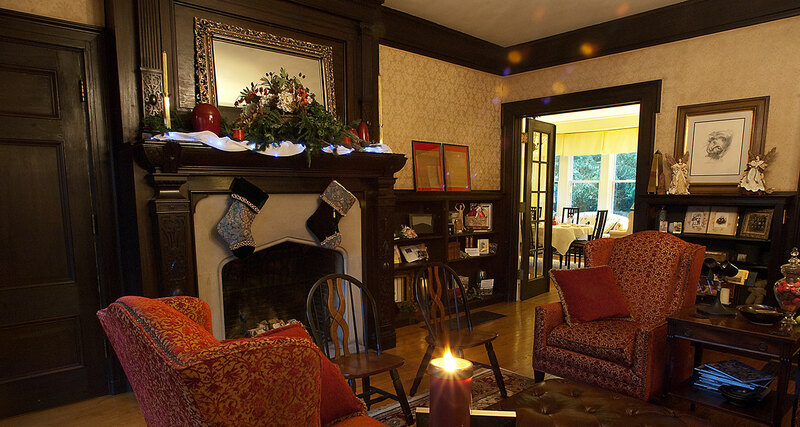 Estate guest are invited to enjoy the Great Room with its carved fireplace, graceful bay window that overlooks the ever-changing picturesque landscape and library corner with its surrounding bookcases, comfortable chairs and piano. Guests enjoy breakfasting in the formal dining room entering through either set of French doors. The view from the bay windows affords glimpses of wildlife to include deer, pheasants, rabbits, squirrels, and chipmunks that meander about the grounds. The glass enclosed conservatory with its southern exposure and the outdoor patio are ideal for breakfast settings in the warmer months. Each guest room is named after the Rochester Philharmonic Orchestra (RPO) show house designer, and has its own celebrated view, with its own distinct personality reflected in its furnishings. 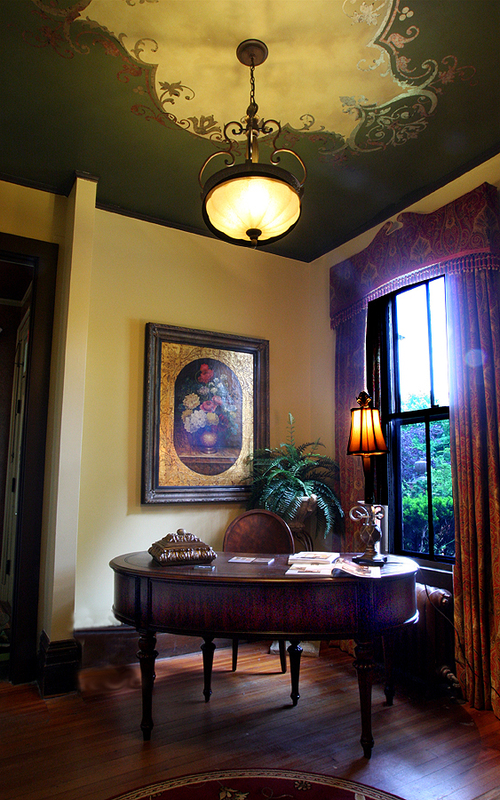 The guest rooms are richly appointed with a mixture of new and antique furniture, artistic wall coverings and murals, and imported draperies covering the windows. Color coordinated luxurious linens, PRANA mattresses, comfortable sitting areas and large closets are standard in each guest room. 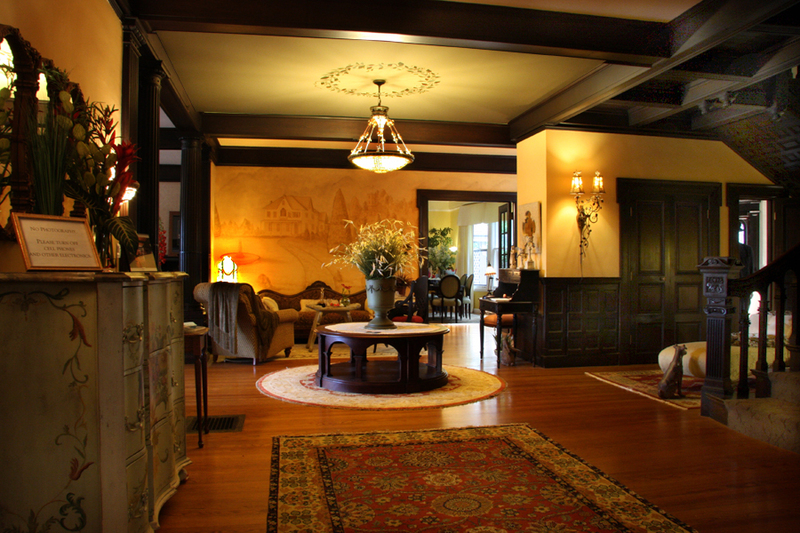 The tranquil pace at the Ellwanger Estate certainly provides each guest with an opportunity to simply relax and recapture the feeling of an earlier era. Take time to stroll amidst the historic gardens, to experience the lifestyle of yesteryear. Treat yourself to a touch of subtle elegance and the ultimate in privacy. The Ellwanger Estate is located in the heart of the Mt. Hope/Highland Historic District, one block from the Genesee River. It is within easy walking distance to Highland Park, the site of the world famous Lilac Festival and the renowned Victorian Mt. Hope Cemetery. Downtown and its major business are five minutes away. Within a ten minute radius from the Ellwanger Estate is the cultural district, College Town, Swiftwater Brewing Co., restaurant row, Highland Park, Mt Hope Cemetery, Greater Rochester International Airport, University of Rochester, RIT, Strong Memorial and Highland Hospital, and Market Place Mall. There is much to attract the Ellwanger guest. And now there is one more as of November 2016: TESLA charger! 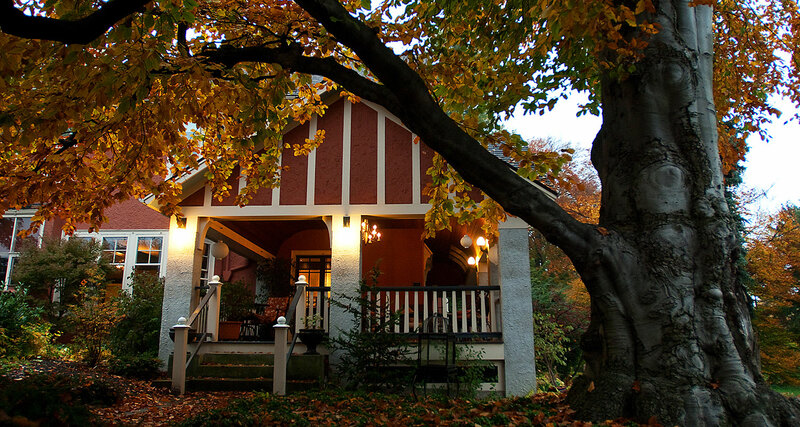 The Ellwanger Estate is truly a celebration in all seasons. The Estate began as a simple farmstead in 1837 under the ownership of James Hawks. George Ellwanger, the 19th century horticulturist of the world renewed Ellwanger and Barry nurseries, then purchased it in 1867. 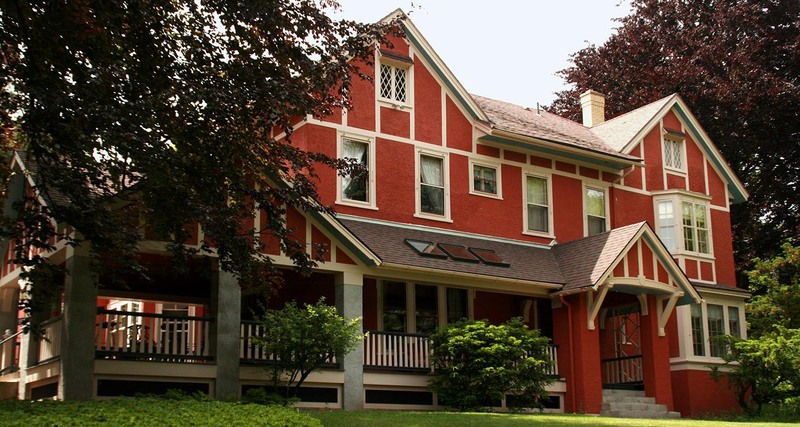 In late 1800’s, major architectural changes were made to the farmhouse under the direction of Rochester’s renowned architect A.J. Warner. Additional changes in 1910 were undertaken by J. Foster Warner, giving the manor its present day Tudor style. It was also in 1867 that the historical Ellwanger Garden was planted. The garden lies on a gentle slope, south of the Estate, shielded from Mount Hope Avenue by a tall gray stonewall. Among the garden’s main features are heirloom pear trees, peonies, boxwood edged paths, flowering ancient roses, scrubs and perennials. The entrance drive to the Estate follows an ancient Indian Trail winding from Lake Ontario to the Mississippi Trail. As you enter the drive, your vision is greeted by the original carriage house with it handsome Palladian windows which overlook the Ellwanger Garden. Helen Cresswell Ellwanger, granddaughter to George Ellwanger, a woman of vision and the beloved founder of the Landmark Society of Western New York, bequeathed the Estate to the Landmark Society in December 1980. It was with the understanding that the grounds be used for the promotion of interest in horticulture and that the specimen tress and gardens be preserved in perpetuity. 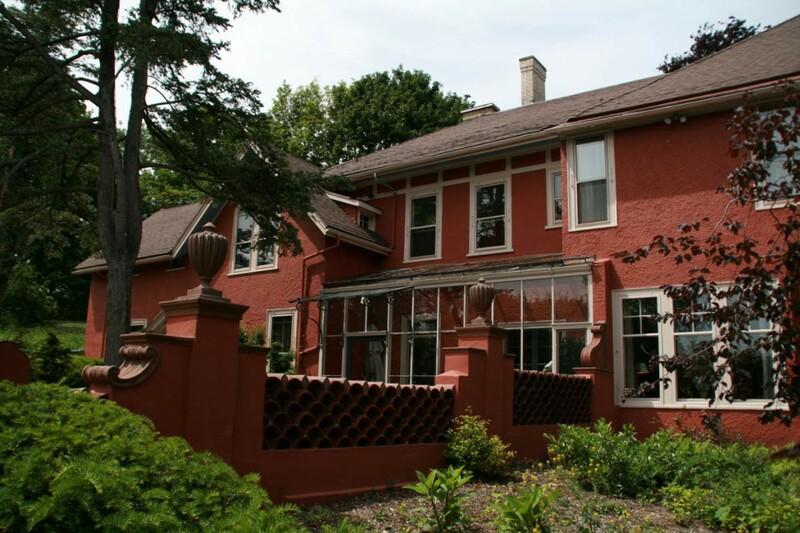 On December 30, 1983, the Estate transferred hands for a third time and was opened as a Bed and Breakfast from 1983-1990. 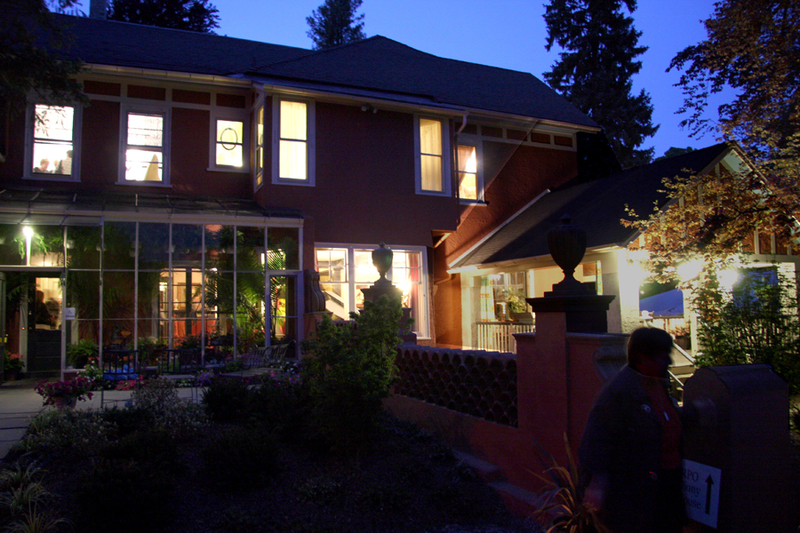 On October 25, 2006, Rosemary Janofsky became the fourth family to own and reside on the Estate.